Does anyone else feel the Bounty Hunter system from having a Bounty is bad? So I dont normally have a Bounty but I fell on hard times and lost the rest of my money to a f*cking hacker NPC in Poker so I shot him in the face and fled town. Long story short I ended up with a fifty dollar Bounty and headed to Rhodes to try and make some money. I camped for the night and woke up to Bounty Hunters tracking me which I killed and looted. I then cooked breakfast and scouted the area looking for some Game to hunt and more Bounty Hunters spawn not five minutes after the last who I then kill and I realised, I can just farm Bounty Hunters for stuff to sell to the fence seeing as killing them does not increase your Bounty. The system is shallow and broken. Its just spawn weak enemies forever until they wear you down. I agree. 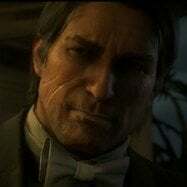 At least in RDR1 it took them ages to track you down and if you caused enough damage, it would be the US Marshals that tracked you down. I would have liked a much longer time between spawns and they only spawn if you stay in the same area for too long, they can randomly spawn in towns and physically ask the locals and shopkeepers about you or they can surround the Saloons or Hotels while you drink and sleep and you get called out. "Arthur Morgan! We have an official Bounty for your capture from the state of Lemoyne!. The building is surrounded. Come out with your hands up and you will not be harmed" etc. Now THAT would have been cool. Its stupid how they can track you down in the middle of nowhere, but won't bother looking for you in a small town like Valentine. The ability to rip down your own Wanted Posters to slow the spawn time would have been good as well. As well as random events like the Murfree Brood ambushing you when you set up camp. Have the event happen when you wake up from sleeping in your tent where a gun pokes through the flap and you are forced out at gun point to which you can submit or grab your gun. Let alone the fact that its lazy, it also defeats the immersion the game is trying to give you. How am I supposed to feel isolated from the rest of the world in Grizzlies West when packs of bounty hunters show up every 5 minutes, especially since the game makes it clear that its a very treacherous environment and can take "days" to travel to or across? And don't even get me started on the infinite lawmen armies in towns. Agreed. It's backwards. You should see little to no Bounty Hunters in the wild if hard Camping. It gives you a reason to "live on the lamb" as an Outlaw. If you stay in the same place for too long then you get Bounty Hunters as they piece together the area you are in. If you keep moving like a vagrant then you will never see Bounty Hunters. I wish they included pardon letters in this game. It's good to know that I'm not the only one who does not like the bounty hunter system. It is fun to be chased, but it is annoying that waves of enemies arrive every 2 minutes. Which also means you're forced to flee 100% of the time instead of being able to stand your ground and plow through anyone coming your way, just because the damn game will leave so many dead bodies around that the walls and floors will lose their collision detection altogether. I'm so immersed in this great western experience when I see lawmen phasing through doors and walls and I suddenly fall through the world. Thanks for playtesting your game Rockstar. Outstanding job.